1 Waffle House Menu Prices. 1.1 Waffle House Menu With Prices. 2 What is Waffle House? Looking for the Waffle House menu with prices? Then read on. You can now easily browse the complete Waffle House Menu, including the Dinner Menu, Chicken Menu, Lunch Menu and the always popular Waffle House Breakfast Menu. 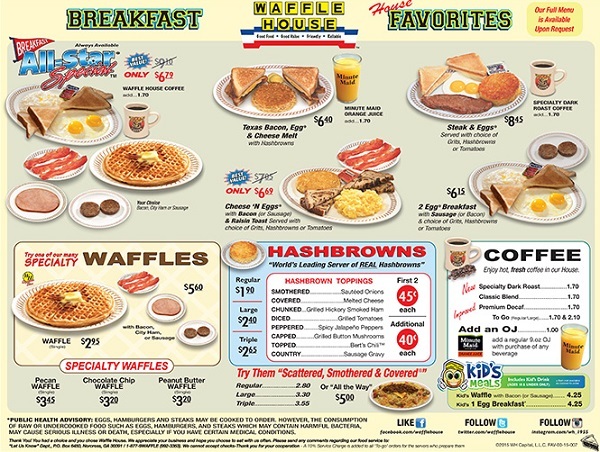 We have added the full Waffle House menu with prices below, so that you can quickly browse the items on your cell phone or from home. The menu you will find at www.wafflehouse.com/menu does not include prices and consists of large Jpeg images and PDF files, that takes forever to load. Please note, however, that prices may vary from location to location. Waffle House Menu With Prices. Waffle House, Inc, is an American restaurant chain with 2100 locations in 25 different states in the US. Waffle House is headquartered in Gwinnett County, Georgia. Waffle House is famous for being an open-all-night restaurant and has now become an icon for its cheap prices, burgers and varied breakfast menu. Unlike many of its competitor’s menus, like Denny’s, the Taco Bell Breakfast Menu and IHOP Menu, Waffle House is not focused just on breakfast items, but also have an extensive burger and steak menu. The Waffle House homepage can be found here. For the latest deals and coupons, please visit the comment section. Did you know that you will get a coupon for FREE Hashbrowns emailed to you as a “thank you”, when you sign up with Waffle House Regulars Club? There is also a new printable coupon available for a FREE Hashbrown, valid until 8 of March 2016. I have eaten at WaffleHouse for years. Even worked for Waffle House for 5+yrs. I have always enjoyed Waffle House food and my children have also. Two of my children even worked for WH, so if anyone is looking for a family-oriented restaurant, then you should go check out the nearest WaffleHouse, I can recommend them. I spent 22 years in the States, lived in OH and went at least twice a week to the wafflehouse in Columbus. on all my business trips driving from Columbus as far as to BC and LA I always made sure I could get breakfast at a Waffle House. I really miss the restaurant here in Denmark. I wish they were represented over here in Europe. I think the Europeans would go for the wafflehouse style of cooking. Just look at how well Mickie D is doing. But alas, here in Denmark we have no place to go early morning or late nite for a decent meal. With many thanks for the great breakfasts I enjoyed at your wafflehouses in the USA. Best waffle I have ever eaten! Print out a Waffle House coupon for a FREE waffle. Valid until 23. June 2015. Limited to one coupon per customer. Waffle House has teamed up with Roadie, the newly launched peer-to-peer delivery service. People sending packages via Roadie can designate a nearby Waffle House closest to them as a neutral meeting place for the package exchange. There will be signage promoting the app at all Waffle Houses, and drivers can get a free waffle when they download Roadie and free drinks whenever they’re on a delivery. Waffle House occasionally offers free waffles or a free hashbrown with a printable coupon. (Monday to Friday only). Get a free Waffle on your birthday by signing up at the Waffle House ‘The Regulars’ Email club at wafflehouse.fbmta.com.